The Kistler Ranch ponds were overflowing with PFFers hunting bass and bluegill on as pretty a day as you could ask for. Quite a lot of bass under a foot were caught and a few big ones, like Jesse Lawson's 15-incher. Up on pond three, the bass were feeding on top all day long. Bobbi Armor hooked 'em until she was too tired to cast. Tom Kilfoil seduced them out of their hiding spots in the holes in the weeds. 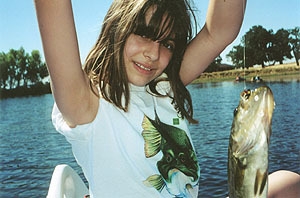 Mandy A. and Victor B. each caught their first bass. Congrats! That blur some saw was Alan F. setting a new record from car to water in the float tube class. The PFF kids, Ricilyn Sanchez, Annie Catanzaro, Laura Kellett, and Alex Tetzel did a good job fishing hard and getting some nice ones. Keep it up kids! Most had enough fun by mid-afternoon and those still on the water dwindled to just a few by evening. During twilight the bite came on again and more fish fell to poppers. The Kistler Ranch fishout was its usual howling success. Twenty-two fishermen and one horse-woman headed off to the foothills with float tubes and optimism. There were two father- son combinations, a father-daughter, and a husband-wife team. The weather gods smiled and gave us a perfect day - warm and slightly overcast and not too hot. The fish were cooperative, and to my knowledge everyon was successful. Reports varied from "some" to "lots", or "did well". Our group was enthusiastic, and the Kistler family cordially invited us back. So the Kistler fishout promises to be an annual event. Keep it in mind. I was so proud of our group. We left the ranch in immaculate condition - no trash that I could find - and Jeannie Kistler hugged me "goodbye" and wants us to be sure to come again!